Greatness is only a result of principles observed. Experience is one of those teachers, but keen observation is the best teacher. Sometimes it is best to step back and observe the situation from outside. Renouncing action does not mean defeat it is a sign of great wisdom and maturity. The best way to see clearly is to observe the situation. To meditate does not mean to fight with a problem. To meditate means to observe. A habit is only a habit until you can observe it. And then it's a choice. 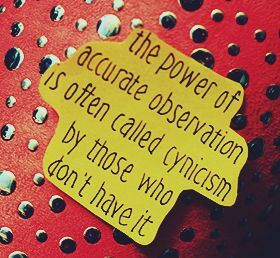 Science adjusts its views based on what's observed. Faith is the denial of observation, so that belief can be preserved. Observation is keenly watching. You can see a lot through observation. 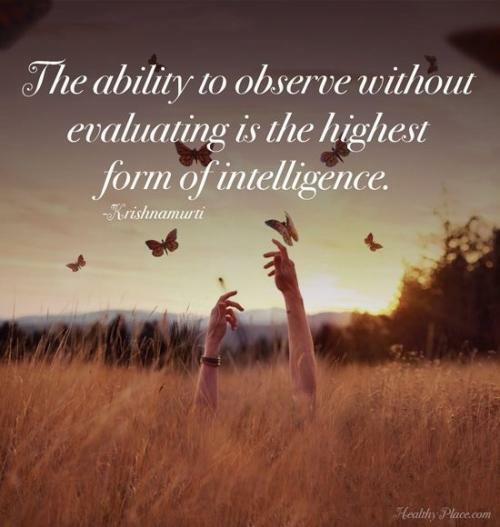 Observation leads to a lot of wisdom and to gain an experience and expertise, a lot of observation is essential. “Reason, observation and experience –the holy trinity of science’ said Robert Ingersoll. Observation must be done to the core because an insufficient observation will only prove to be disastrous as it will lead to many errors and wrong conclusions. As Alexis Carrel says, “a few observations and much reasoning lead to error; many observations and a little reasoning lead to truth”. Observation is better than reading many pages of a book as it gives a practical knowledge and the latest happenings as compared to reading from the book. Also, observation depends upon the perspective with which we view things. It may vary from one person to another. Here are quotes on observations read them; they are worth observing.